'White henna', 'gold henna' and 'silver henna', are not henna. 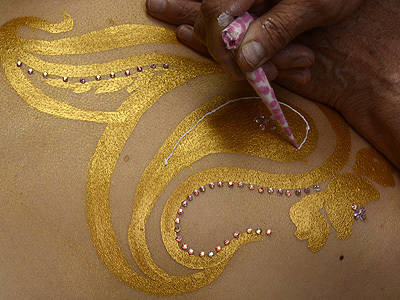 'Gold henna' and 'silver henna'can be created safely with materials including Temptu temporary tattoo paint, Becoming Moonlight® gilding paste, Mehron Precious Gems powder, and Becoming Moonlight® gems. These materials have been formulated to all work together successfully to extend artists' imaginations and techniques. The materials used to this create 'gold henna', 'silver henna', and 'white henna' design are waterproof, durable, and safe. This pattern will last from three to ten days on the skin, depending on care. These materials can be used to safely make shimmering metallic and jewel culors. To begin: shake the bottle of Temptu vigorously before using. Put a few drops of Temptu temporary tattoo paint on a plate. Apply Temptu with a brush on clean, dry skin. Temptu will dry in a few minutes. It will remain slightly sticky until you apply gilding powder. When you have finished painting, generously brush gold gilding powder over the yellow Temptu to seal the Temptu and make it durable and waterproof. 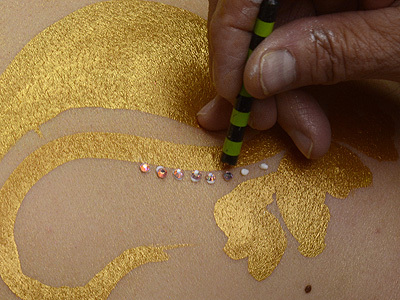 Yellow Temptu brushed with gold gilding powder makes a waterproof, shimmering metallic gold temporary tattoo on skin. Brush away the excess gilding powder with a large, soft brush. If the powder clings to the skin, you may rinse it away with water, or wipe it away with a moist cloth. 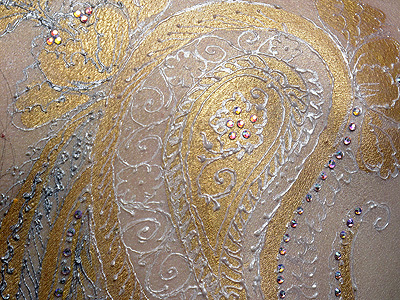 If you want to add gems to your art, apply a drop of 'white henna' adhesive paste to the points where you would like to set flatback rhinestones. Press a birthday candle onto the domed side of a flatback rhinestone. Pick up the rhinestone with the candle, and place it on the dot of the paste. Continue until you have bejeweled all of your pattern. 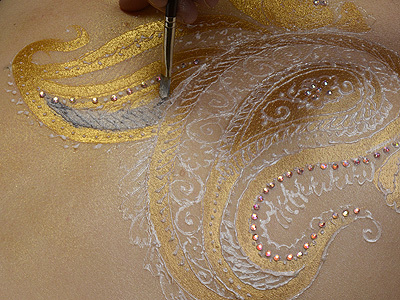 Apply 'white henna' gilding paste as you would henna, but use much finer lines. 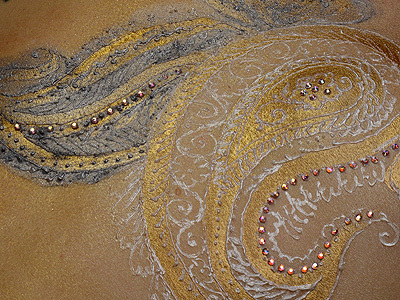 Use the gilding paste to define and enhance your Temptu pattern. Allow the 'white henna' paste to dry for about ten minutes. Touch the gilding paste gently, to see if it has become firm and tacky, rather than liquid and sticky. 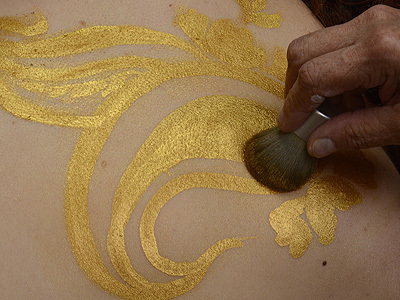 If you use Becoming Moonlight® gilding paste to create 'white henna', you'll be able to see your work as it dries. 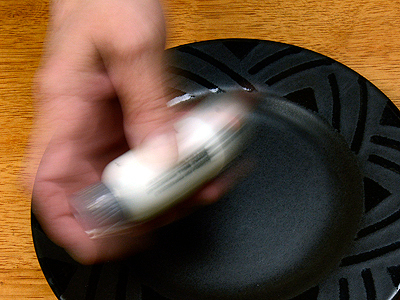 If you use Pros-Aide adhesives, the lines will become transparent as it dries. Gilding powder will make the paste durable and waterproof. 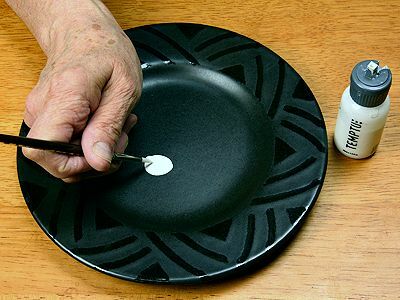 If your brush sticks to the 'white henna' paste, stop and let the paste dry a few more minutes. 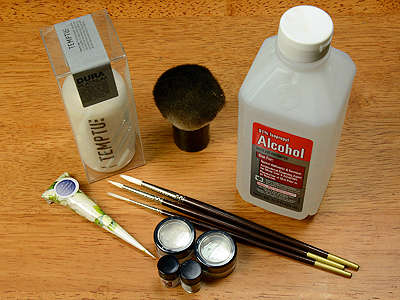 If the bristles of your brush get 'white henna' stuck in them, rinse the brush with 91% isopropyl alcohol. In this work, use two colors of gilding powder, one after the other, to create white and silver over the 'white henna' paste. When you have coated all of the first colored area of 'white henna' gilding paste with gilding powder, brush away the excess. Take care to not spread the first color into the area where you will have the second color. 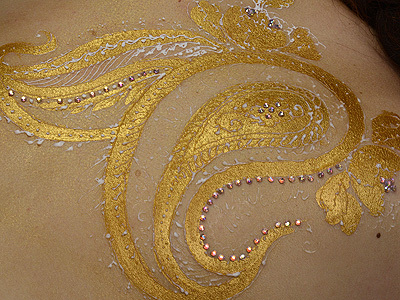 Apply a different color of gilding powder to the other section of your 'white henna' paste design. The second color of gilding powder will not stick to areas previously coated with the first color of gilding powder. Brush away the excess gilding powder from the second area. When your Becoming Moonlight® body art is completed, it will be waterproof and remain on the skin for three to ten days, depending on care. If you want to remove it quickly, rub the pattern with the sticky side of scotch tape to remove the 'white henna' paste, and scrub with lotion to remove the Temptu.